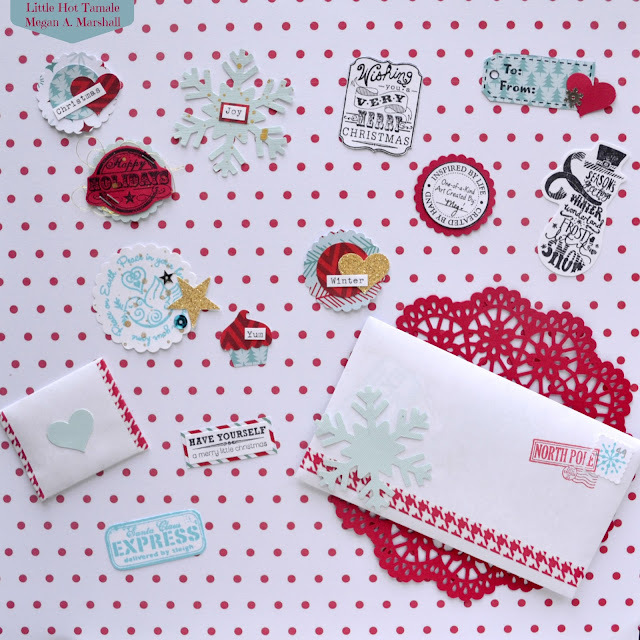 For my embellishments I wanted a vintage vibe so I chose the paper pad "Snow Day" by The Paper Studio. I absolutely adore this paper pad, especially the fun prints that coordinate perfectly together. The majority of my stamps for this project are wood mounted stamps that came in a bundle of 6 for $6.99 in the holiday crafting section of Hobby Lobby. Just a reminder, you don*t have to use the same products as me. Use what you have. If you don*t have stamps, print images from the internet. Punches? Try making your own template and trace it on your desired paper and fussy cut it out. This is a great way to try new styles without investing in a paper punch you may not like. Below I shared my full video tutorial for my handmade embellishments. I hope you enjoy it. :) If you like crafty videos, check out my YouTube channel: Little Hot Tamale. I have all kinds of creative tutorials such as scrapbooking, happy mail, and jewelry.